A proper beef pho is a real labour of love, but if you want those heady depths that a good pho brings, it is well worth the time and effort. Thuy Pham serves up a southern-style beef pho recipe, the kind that is made in the Mekong Delta in Vietnam where she is originally from. The herbs in this dish are really integral to enhancing the flavour of the broth, so serve big bunches on the table and allow guests to tear them into their bowls to adjust the flavour as they wish. This recipe is taken from The Little Viet Kitchen by Thuy Diem Pham, published by Absolute Press. Photography © David Loftus. Beef pho is our national dish and so synonymous with Vietnamese cuisine that the quality of your broth goes a long way to defining you as a chef! Like many Vietnamese classics, the flavours will vary greatly depending on where in the country you are from. As I’m from the Mekong Delta, the recipe I’ve written here is the southern style, which is closest to my heart. 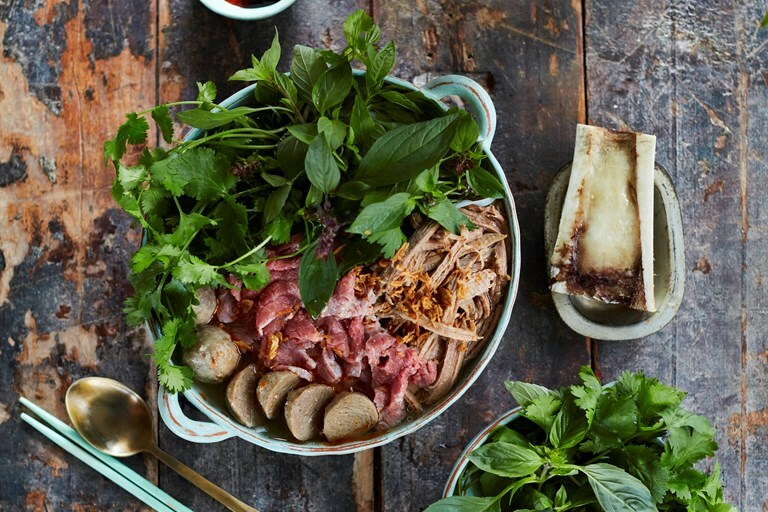 Tweaked over generations to suit the tastebuds of loved ones, this is the recipe I have worked on since the launch of The Little Viet Kitchen and is one that I’m proud to share with you here. Finally, enjoy your first spoonful of broth… You deserve it chef!